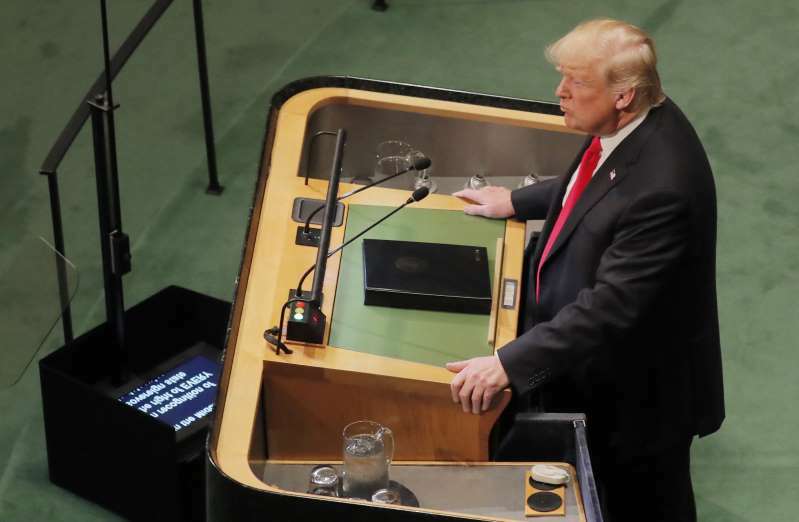 © REUTERS/Caitlin Ochs U.S. President Donald Trump pauses as he addresses the 73rd session of the United Nations General Assembly at U.N. headquarters in New York, U.S., September 25, 2018. Mr. Trump rattled off a list of accomplishments on the economy, tax cuts, military spending and the border — many of them cherry-picked, exaggerated or false. He is right that the United States stock market is soaring, and unemployment rates for Hispanics, African-Americans and Asian-Americans have reached record lows. But he omitted less flattering indicators when describing an economy “booming like never before.” For example, G.D.P. growth is healthy, but reached higher points as recently as 2014. The unemployment rate is at an 18-year low, but is higher than several months during the 1940s and 1960s. And wage growth is still slow: after adjusting for inflation, average hourly earnings increased just 0.2 percent in August. Mr. Trump’s claim of signing the “biggest” tax cut in American history is false; by various metrics, several rank higher. He misleadingly said construction on the border wall with Mexico had begun; projects to replace fencing and barriers are underway, but the administration has not begun to build a 1,000-mile-long wall. He was also wrong in characterizing recent military spending bills as “record funding.” Even without adjusting for inflation, President Barack Obama signed legislation in 2010 that provided more money for the military. Additionally, Mr. Trump has signed a relatively low number of bills when compared to other presidents, even at similar points in their terms. While he can claim major legislative victories — on tax cuts and veterans’ benefits — he has also been unable to deliver on other key campaign promises, like the border wall and repealing and replacing the Affordable Care Act. Mr. Trump’s declaration of victory is slightly premature. The Islamic State is down to its last 200 square miles, about 1 percent of the territory it previously held in Iraq and Syria, The New York Times recently reported. Pentagon officials have stressed that their job is not done. There are still “remaining pockets” of Islamic State fighters in Syria and Iraq, and they continue to threaten the two countries’ peace and security, Col. Sean J. Ryan, a Defense Department spokesman, told reporters on Sept. 18. Defense Secretary Jim Mattis told reporters on Monday that American troops will continue to train and advise local security forces to make certain the Islamic State does not resurface. He said “fighting is ongoing” in Syria’s Euphrates River Valley, where troops have been battling the Islamic State. Mr. Trump is right that the United Arab Emirates, Saudi Arabia and Qatar have contributed funds to ease humanitarian crises in Syria and Yemen. But his comment glosses over the three countries’ roles in Yemen’s civil war. The governments of Saudi Arabia and the U.A.E. are the top two donors to the United Nations’ humanitarian response plan in Yemen, contributing nearly $1 billion combined. Additionally, the two countries donated another $375 million through other programs, the data show. Qatar also contributed $500,000 to the United Nations response plan. In Syria, Saudi Arabia donated $18.6 million this year to the world body’s humanitarian response plan and $24.3 million in 2017. Qatar contributed $2.2 million in 2018 and $29.5 million last year, the same reports show. Dollars aside, it’s worth noting that the United Nations and human rightsgroups have said that the humanitarian crisis in Yemen has been exacerbated by the country’s ongoing civil war. A Saudi-led coalition — including the U.A.E. and the United States — has since 2015 fought Iranian-linked Houthi rebels who ousted the government of President Abdu Rabbu Mansour Hadi of Yemen. Qatar initially was part of the international coalition fighting the Houthi rebels, but was expelled last year after Riyadh accused the tiny nation of funding terrorism, cozying up to Iran and welcoming dissidents. A report by United Nations investigators in August accused the Saudi-led coalition of potential war crimes, including charges of killing thousands of civilians in airstrikes, torturing detainees and conscripting child soldiers. The same report also accused the Houthi rebels of possible war crimes. The reaction to the United States withdrawing from the Iran nuclear deal in May was more varied in Middle Eastern countries than Mr. Trump’s claim would suggest. Saudi Arabia, the U.A.E., Bahrain and Israel issued statements supporting Mr. Trump’s decision. But Syria, Iraq and Lebanon voiced disappointment. Jordan’s foreign minister warned of a potential arms race in the region absent the nuclear deal. Qatar, Egypt, Kuwait and Oman issued cautious statements that stressed their commitments to peace in the Middle East, but did not take clear positions on the United States’ withdrawal. Outside of the Middle East, global reaction toward Mr. Trump’s decision has largely been negative. The six other parties to the treaty with Iran — Britain, France, Germany, China, Russia and the European Union — opposed the withdrawal. So did Canada, Australia, Ireland, Japan, Norway, the Netherlands, South Africa and Sweden, according to statements compiled by the Arms Control Association. As The New York Times and others have repeatedly reported, Mr. Trump is overstating the figure by about $250 billion. Last year, the United States had an overall trade deficit of $552 billion, according to the Census Bureau. That included a goods deficit of $807 billion, offset by a trade surplus in services of $255 billion. Mr. Trump’s preoccupation with trade in goods contradicts his own White House economic report, which he signed and was released in February.